Create Group: Allows you to create Client group for the clients. Edit Client: Edit the selected client. Delete Client: Delete the selected one or more clients. Enable Super Client: Allow you to put client in Super Client mode and make changes which can be saved when mode is disabled. Disable Super Client: Disables Super Client mode and allow you to save the changes to the image. Refresh Client Info: Refreshes Client information in the columns which are not showing. Copy Client Info: Copies the selected client’s information to use for making CSV or other use. Auto Scan: To Scan the client "Start IP" and "End IP" and to automatically add the client list. 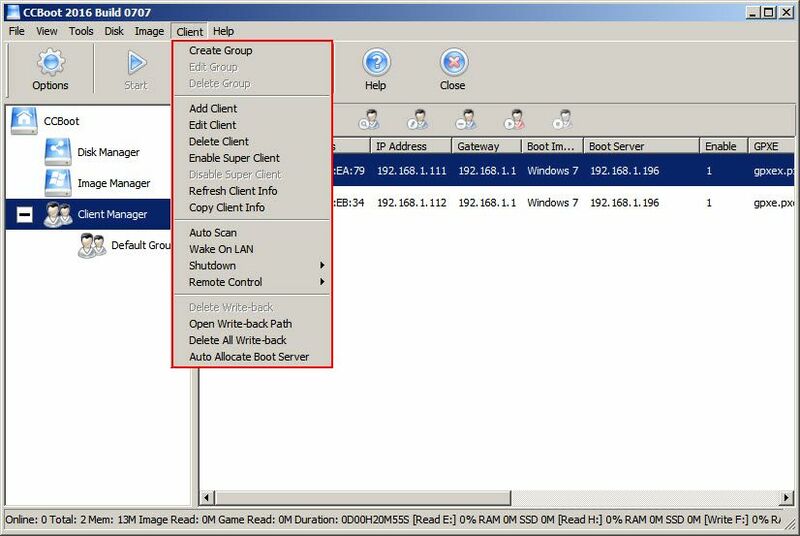 Wake on LAN: The Server can remotely wake up the selected Client/s. Magic Shutdown: Put the selected Client PC/s to sleep mode like state, clients can be woken from this state using Wake on LAN command. Delete Write-back: Clear the client "Write-Back File". Open Write-back Path: To show the client Write-Back drive location. Delete All Write-back: Clear all Client Write-Back File. Auto Allocate Boot Server: Intelligently assigns automatically the Boot server IP for all clients.